All human history, and just about everything else as well, consists of a never-ending struggle against ignorance. What is behind the widespread attempts to discourage, if not to banish entirely the use of analogies that refer to the activities of the Nazis and their advocates in Germany in the 1930's and '40's? What causes people to attack instances of what they call, among other names, "Hitlerization of the discourse?" Why is Godwin's Law regarded by some to be as valid as, say, those laws of physics that were postulated by Isaac Newton about gravity and the like and have successfully withstood the tests of centuries? I'm not referring to the sense in which Godwin put his proposition, which was that sooner or later in any online discussion, analogies to the Nazis would be made. I mean instead the use that is generally made of his observation now, as a way of saying that anyone making such an analogy has automatically lost the argument, and all ears should be closed to that person at once and forever? It matters that though the Nazi armies were at length destroyed, their concepts were not, and their actions went far beyond the aspirations of a particular political party in one middle-sized European country during several decades in the mid-20th century. ("Middle-sized" that is, except when the Germans went on the march, which they did several times starting in 1870, when it was always amazing how they could suddenly expand into being a very large country indeed!) The Nazi beliefs turned out to be the purest and most easily understood form of the aspirations of many other groups from then on, to put various other groups of people, usually but not always pigmented more generously than they, into huge, secure prisons of several kinds and also into the ground, as can be seen from many things that are happening now, in the United States as often as anywhere else. A country that relies so much on a book that was written over 2,000 years ago, and on a Constitution that is now over 250 years old has no business treating toxic events that happened such a relatively short time ago as if they had never happened at all and that are instead still serving as heady inspirations to many who spend all their time oiling their guns and sharpening knives. It is interesting that the originator of Godwin's Law, Mike Godwin, is still very much around and that ever since he formulated his law, 26 years ago, he has monitored the way it is often cited, and he doesn't seem to support the practice of using it as a decisive sledge hammer, though that might not be obvious from the title of his article that appeared in the Washington Post in December 2015, which was, "Sure, Go Ahead and Call Trump a Fascist, but Just Be Sure That You Know What You're Talking About." I think, however, that my point still holds and that concepts like "fascism" and "Nazi" long ago got past the confines of events in the Second World War, so that today they are as general as the terms "good" and "bad." And Hitler, Goebbels, Himmler, Mussolini, and the others have never "belonged" solely to their victims, as some people seem to think. They are concerns of all humanity, and of all later times. No matter how often analogies are used, if they are apt they are good analogies and highly resistant to arbitrary executions. So, I'm permanently stooped and lop-sided, I can't walk in a straight line, and I'm a slow walker, though I could move much faster and maybe even run, but there is almost never any occasion to do either, especially to run.. Also I live in a world filled with a light fog that lifts only during the several hours just before dusk. I don't get enough sleep, I'm always suffering from several kinds of cold, my longtime favorite books are crumbling or fading into mere collections of blank paper or both, I can't eat steak for fear of choking to death, partly because it's been years since I had the last tooth that I was born with, songbirds are getting rare, the frogs over in the wet spot beyond the creek where I tried to dig a spring no longer announce that April is somewhere close, which means they must be already extinct, and in the latest of five or six attempts in various eras, my memory yet again seems to be unwilling or unable to find room in all its clutter for more than the first 215 or so of the 759 lines that comprise John Greenleaf' Whittier's still phenomenal 1866 poem "Snowbound." Note: The image that precedes this post is of one of my paintings, done in 1994. 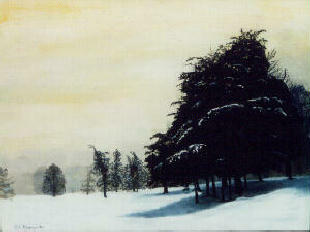 It is called "Snow Pines,} and it is painted in acrylic and measures 19" by 24." It shows a scene at the National Arboretum in Washington, D.C. Two years after finishing it I donated it to a very cause. Nevertheless missing it, as I have with every other painting that has gotten out of my hands, and also because I had it for such a short time, I planned to paint another version, slightly different in some way, but of course, as with so many other things, I've never gotten around to that..
With three major candidates still going for each other's jugulars and two others barely hanging on, last night the Republicans held their 13th and last debate (better called "playground scuffles"), before Super Tuesday occurs in just four more days, after which I hope they hold no more of these things, or that, if they must, the media of all kinds won't pay so much attention. Confrontations of any sort, short of those that appear on chessboards, have never appealed to me anyway, and debates are especially distasteful. But when Republicans hold them? Ugh! Yet they call themselves "the party of Lincoln," a known great debater. Suddenly recalling what Lincoln did about the slaves, they would love to say "the party of Reagan" at least as much or even more. But it's noticeable that they hold back on doing that, because even they know that that doesn't resonate nearly as well. In his contests against Carter, Reagan got a lot of "gotcha" mileage out of constantly saying "There he goes again," and I could never understand why that was never called out for being what it was – without substance of any kind and childish in the extreme after the first or second time. From the internet accounts of last night's melee, you would think that Carson and Kasich have already dropped out and weren't even present, though they were. That left only Rubio and Cruz to see what they, individually or in unison, could do about cutting the longtime frontrunner, D. J. Trump, down to size – a tall order for them even when it came to physical height. CNN gave the impression that Rubio if not Cruz succeeded in that, but Talking Points Memo in a very eloquent post maintained that Trump dominated, and I buy the point that he was far from buried but not the use of the word "dominated." While hitting on my analogy I remembered that in his heyday, one of the principle nicknames that Bill Clinton's many fans had fondly used for him was "Big Dog." And I also remembered that when Clinton thought the Repubs weren't making a good point, he liked to throw some home-brewed Arkansas in their faces by saying, "That dog won't hunt." For those and other reasons, that's why dogs come so easily to mind for analogies when talking about shaky politicians. But one good thing about these Republican shoutfests is that they are certainly giving the Democrats a lot of raw materials to use when, this coming summer and fall, the Big Push comes to the deciding Shove. Guess who the woman is whose images appear above? Hardly anybody this side of Gibraltar, or on this side of Malta for that matter, will know. But Americans especially should know, because whether they acknowledge it or not, not a day passes that huge numbers of them don't genuflect to this woman and her accomplices in crime, in the form of a cool million dollars and more that every day of the year the U.S. government drops into the bank accounts belonging to her and her collective national family, with testimonies of love, undying fidelity, and best wishes. Her name is Ayelet Shaked, and she is 39 and she is married to a reserve fighter pilot and she has two children and she is one of the three or four biggest members of the Israeli power structure, because the Yahu guy chose her to be his -- and secondarily Israel's -- Justice Minister. And who could've blamed him? With her and her resumé in the tech and the political fields at hand, who would not make such a choice? Best of all from Yahu's point of view, without a blink she spouts opinions and desires that even he, the most shameless of men, might hesitate to say publicly. Unfortunately, however, the things that Ms Shaked cooks up in her noggin and lets slip through her lips or through the often dangerous practice of posting stuff on Facebook indicate, above all else, that.she is steeped in Evil, to say the least. I mean really, really, major league Evil! And remember that you heard it here first. Meanwhile don't worry about me. Where I live, you actually can't get here from there, and so the Mossad will never be able to touch me for saying that. Or am I depending on my lifelong total insignificance a touch too much? A man who posts the concepts that I present year after year with hardly a comment being made can't expect that situation to last forever,.though Blogger keeps trying to scare me by indicating that this blog gets as many as a couple of dozen page views per day. There has to be some mistake. I guess those unknown scanners just take one glance, sneer, and continue on their merry way, especially since my site is light on images. But anything about Ayelet Shaked demands her picture. Like it or not, she is defined by her appearance as much as by anything else, no matter how much everyone might try to stay cool about it. I suppose that I've been thinking that some sort of excuse needs to be found for Ayelet Shaked ever since she first came to my attention two years ago, courtesy of Mondoweiss, or Mondomooser, take your pick – a website operated by Jewish anti-Zionists and a large crew of regular commenters on the same beam, augmented by a smaller band of true-blue pro-Zionists who might be even more Jewish and who are always ready for quarrels that, though vicious, never descend into the absolute muck of most internet comment sections on volatile subjects, perhaps because that site is moderated, and the anti-Zionistas who run it let their opponents have their say, within limits that aren't always easily discernible. And Ms Shaked (I assume that that is pronounced in some way that is not as digestible as it looks in English) is not the only winsome female horror show in Israeli politics. There could be many others. I know of at least one other, also through Mondoweiss, who is just as deadly, named Caroline Glick. You haven't heard a wrong-headed rant till you've heard her on the rampage, yet it's remarkable how she does wonders for the seated position. Check her out in the Mondoweiss archives of a year or two ago. What is it about the Dead Sea that produces such ladies? The other day, as I said in another post here, I saw for the first time a large number of Beyoncé photos all on one webpage, and I was struck by how they were so varied that I couldn't be sure which one showed her ordinary appearance, in case I should happen to spot her in the local Food Lion, cruising the cucumbers. That made me think of Israel's Justice minister, maybe because I realized that unlike the case with Beyoncé Knowles, if Ayelet Shaked were to walk into the room, I wouldn't be aware that I should make an instant exit and look for a kevlar vest, because the only time I had previously seen her picture, it had been too dumbfounding. I decided I needed to see if there was such a page showing Shaked's likeness and so also to see if my first impression of her being so striking still held regardless of her program, and there was such a page, consisting of more than a hundred photos, a lot of them posed just as if she is also among the world's star entertainers, none of whom have anything on her. But in contrast to Knowles, all of Shaked's shots were clearly of her and no one else, regardless of her pose, and I thought that that said something important about those two very different women and their callings. But even more I wondered how Shaked could be the same woman who was alleged to have said on her Facebook page that all mothers of Palestinians should be killed, so that they would not keep producing what she called "little snakes." It would be easy to think that that was an invention, meant to smear Israel's Minister of Justice beyond all redemption, were it not for the fact that every day a thousand injustices inflicted on the Palestinians take shape in that country that appear to be inspired by just such a statement. What is going on here? Are sentiments like that, openly expressed, the kind of thing that is expected of someone in Shaked's position? Are any of the Holocaust victims recorded as saying such things, even in the moments just before the xylon hit their lungs? Is a second Holocaust now taking place in Israel, this time much more of souls among one group than of bodies in the other? I am completely baffled by how a woman who has an appearance configured as notably as Shaked's can harbor such an evil, monstrous, and bestial sentiment as that, especially since she is a mother herself. Something really dire must've happened early in her life, or it was something that she witnessed or that she did, that nobody's telling. There is no other explanation. Those aren't the only horrible things that she has said, along with the policies that she has espoused and that are designed to make the lot of the dreadfully mistreated Palestinians even worse than it already is. Where she lives "justice" has obviously been redefined for the much worst, just as it has in that colony's mother country, the U.S. I wonder if Ayelet Shaked has ever thought about trading stories with Palestinian mothers, especially those whose children have been shot out from under them by the IDF? It's hard to imagine a bigger waste than this woman and her doings, who, however, if one didn't know better, might be mistaken for a lily in the fields, only recently opened into bloom. Stand By for Super Tuesday! It is now only a week till the first of three high points of this year’s national elections in the U.S. will occur. This will be Super Tuesday on 1 March. The source that I consulted indicated that 14 states and one territory, American Samoa, will be voting. The number of those states is equally divided between the old Confederacy and everywhere else in the country. All the candidates still in the running are already frantically checking their meds. because more delegates will be gained that day than on any other one day before the conventions. In comparison the dribs and drabs of Iowa, New Hampshire, Nevada, and South Carolina till now will suddenly become small potatoes, though they did serve to knock off a bunch of candidates, very lightly among the Democrats because they only had a few to begin with, but extremely heavily among the Republicans, since most of the time their clown car was bursting at the seams. At the start they had 17 aspirants eager to emulate Obama, thinking that if that you-know-what could, then surely they could as well, and better. That number seriously wrecked TV viewing through the past six or seven months, due to the large amount of GOP stumble sprees that were supposedly debates. Today, with financial troubles still in the news and possibly very much in prospect, you don’t hear much about credit default swaps. What has become of them? Driven underground? No longer existing? That is to be hoped, because, as Sanders said at the time, very few people could tell you what they are, and it’s been years since I could even pretend to know. They were some brain-busting things for sure, because they were so illogical, and that should’ve made them illegal from the start. One would think that by now Sanders would be already shot down because he is associated with socialism, but that doesn’t seem to have hurt him, maybe because it’s been determined that the same could be said of many of the U.S.’s founding fathers. Over on the Republican side, the 17 have also essentially been cut down to just two, though there are still three others still hoping for a miracle. But what a pair! Cruz and Trump, with the latter in the lead, though not by much. Neither one is anything to write home about, though Cruz seems to be hated by more people, including many in his party. I think I know why Cruz is so despised. As Clem Kadiddlehopper, the rural character of a great comic of the past, Red Skelton, would’ve said, he just doesn’t look right to me. And then there are dozens of issues that he has ack basswards. The latest came up just a couple of days ago. Suggesting that when it comes to current events, he is no better than a laggard in a high school civics class, Cruz said that if elected he will direct the Federal Government to turn over all its public lands in Nevada to that state, which essentially means eventually into private hands, i.e. the 1%, That must mean that he also supports the recent takeover of the Malheur Bird Sanctuary in Oregon by a bunch of armed rural gangsters, all of whom are now in jail, except for one woman who is now suing the Government for the Biblically significant amount of 666 million dollars and one man who is now deceased, having been shot after he nearly hit a police officer with his pickup truck while trying to evade a road block. Those criminals kept trying to justify themselves by saying their goal was to “return” that sanctuary to the local population. But those locals were actually quite happy to see the Government get back the bird refuge. See my recent post on LaVoy Finicum. In the meantime it’s been said that Cruz’s wife, who has been photographed trying to avoid being kissed by him, is supporting Hillary Clinton. That doesn’t seem to have been reported by anyone in the media except Gawker, whose creed is that rumors quite often turn out to be the truth. Donald J. Trump on the other hand, comes off as little more than a comedian, and I can’t help thinking that he’s mainly in this for the chuckles. I think he tipped his hand in the very first days of his candidacy, when he said that there was no use in having these elections at all, because that quickly he had already gotten so much support that he might as well be declared the President then and there, and that would be the end of it. No muss, no fuss. Very few people remember that unseemly display of bravado and egotism, but I do. And I think it is only the miserable quality of his opposition so far that he has held the lead among the other Republican candidates for all except a few days. But his advantage consists of only one-third of the vote in only one of the two parties. One reason that the imminent Super Tuesday will be so interesting is that the day after we will suddenly know a lot more about that situation. For now I just know that my crystal ball can’t see him representing the United States at the next G-8 meeting. At the next Miss America pageant, yes. At the next international climate meeting after Miami settles under the Atlantic Ocean, no. I also think it’s strange that, though D.J. Trump has offended many groups, so far, to the best of my knowledge, he has avoided attacking, at least directly, that easiest of Republican targets -- people who share my kind of African ancestry. Why? Is that a mere oversight or what? Is he saving us for the real kill, should things get so tight that he has to try to squeeze out of the bigoted elements in the electorate more than just depending on them to “purify” the attendance at his speeches, or has he simply forgotten that we even exist? Donald J. Trump is a hard bird to figure out. I seriously doubt that he himself has anywhere close to a clear idea of what he is about, and if one was listening closely, they would’ve heard him admitting as much, on several occasions. A few weeks ago, in January 2016, I happened to read an article in the online magazine, Counterpunch, written by a man named Chris Zinda. It was about Zinda's accidental encounter on the 13th of that month, in Cedar City, Utah, with Robert LaVoy Finicum, a right-wing activist in the long-running battle between some supposed ranchers (though really just moochers in ten-gallon hats) and the Bureau of Land Management, the BLM. Zinda, an activist himself though in the opposite direction, recognized Finicum and was surprised to see him “on the loose.” Two weeks earlier a federal property, the Malheur bird sanctuary in one of the next states over, Oregon, had been taken over by a bunch of rustic knockabouts, and Zinda knew that Finicum was the spokesman of that group. And so, Zinda thought, Finicum should not have had so much freedom of movement, and in Utah, not that distant but also not quite next to the scene of “battle,” that is, the occupation. And for what purpose, we might ask now. For Finicum to hook up with his wife? Or to recruit new members for the effort? Or to pick up much-neededsupplies, to add to those already being heavily begged for on the internet by the miscreants, who were heavily derided by many when that become known? That early in the “campaign” the answer to the Finicums' presence in Utah added to the list of unknowns, along with how it eventually turned out that Finicum was also the participant who was the most illustrative of what the bird refuge invasion was supposed to be all about, and he was the embodiment of how it did turn out. Zinda tried hard to notify the FBI and other authorities of Finicum’s whereabouts, but none of them seemed to be interested. --At least they pretended to be uninterested, but it now seems obvious that the authorities were interested but that at that moment an elaborate trap was in the process of being set for those scruffy occupiers, all of whom were armed, and the Law saw no need for an outsider writer to get any inkling of what we could now call the "Slow Motion Malheur Turkey Deadfall," given the reputation of those fowl for not being the brightest of birds. Only a few of those intruders on the sacred territory in eastern Oregon of an Indian tribe called the Paiutes and a large variety of birds were participants in what sounds to me like a big scam going at the expense of the Federal Government and, by extension, the American public. The rest were characters who jumped at the chance to pick up their guns and take part in yet another jab at the U.S. government and to profit from it, even if only in the form of personal emotional gratification. Like much of the rest of the land in states as forlorn as Arizona, the property that “ranchers” of Finicum’s stripe actually own is likely to be so desiccated that it shouldn't be used for anything at all, except to be photographed. So they are able to call themselves "ranchers" only because the U.S Government, in the goodness of its heart, leases out to them through the BLM vast acreages of adjoining land, for fees so low that the whole thing has all the appearance of being outright giveaways..Thus, Finicum’s standing in this group was enhanced by the fact that he had an allotment of no less than 17,000 acres, on which he ran all of 84 head. Here in rural Virginia where I live, that would be considered a stupendous amount of land for one man's use and for so small a herd. That 17,000 is four times the acreage of my entire county! But it rains here, which means that weather-wise if not always in its politics, Virginia qualifies as being habitable. In Arizona very little rain bothers to fall, which means that no animals, human or otherwise, should be living there, other than the scorpions, snakes, and roadrunners.—not if it takes that much territory to run a relative handful of cattle, or if , like the Hopis, you already have it all figured out. So probably to live in a style befitting himself and what we have on Mr. Zinda's good authority was this man's lovely wife, Finicum apparently had had to resort to a couple of other hustles – pardon me, "activities," the first of which doesn't have to be a hustle at all, if it is tended to properly. That one was taking in unfortunate boys for foster care on his ranch – in another almost unbelievably large number for one couple to handle– fifty (! )– and for which he was said to have received as much as a million dollars a year, if what I read was correct. If Lavoy Finicum had known what we all know now, I believe he would've been satisfied with that and stayed at home -- usually the best thing in any situation anyway. But then, maybe not. Maybe he had already become irreversibly doomed by simply becoming a "rancher" in Arizona. Whatever the cause, at the very beginning of this New Year of 2016 he and his lovely wife were not to be found in Arizona with their profitable charges. Instead they were happily tooling up to the more frigid and quite unlikely clime of eastern Oregon, eager to take part in another hustle or dodge that had become dear to their hearts and to a number of their fellow "ranchers." This second hustle was to apply pressure on politicians to change the laws enough to force the Federal Government to transfer control of as much as possible of its huge acreages in states mostly in the West -- including many national parks and monuments -- to the states and counties containing these places, so that in turn those jurisdictions could be influenced to sell or just relinquish title of formerly leased lands to what these guys considered the rightful owners of those properties -- those questionable "ranchers" themselves -- and forget others in the neighboring area, or the local Earlier Inhabitants like the Paiutes tribe, or the actual owners of all that territory, the vaunted American People, and it was on their behalf that the Government operated. Thus -- if I can be forgiven for presenting what seems to me to be a logical projection of this kind of thinking -- the next time the American People motored west to check out all those wonders of nature that they been told from birth belonged to them merely by being U.S. citizens, they would find those sights and experiences barred to them -- not, however, by countless barbed wire fences patrolled by heavily armed good ol' boys, with entrance allowed only on payment of enormous fees levied by a few grinning, rough-edged, newly minted American rustic millionaires -- the new owners of places like the Grand Canyon and all its adjoining wastelands, as men like LaVoy Finicum and his cohorts, the few that were capable of looking that far ahead, might have dreamed. The author pointed out that the real beneficiaries of the efforts expended and the risks taken by the Malheur invaders, should the anti-BLM efforts prevail and all those western lands fall into private hands and become available for grazing, mining, and other forms of exploitation, have long since been present, with the big bucks in hand, and these men are just aching to gobble up more. Truly huge acreages are already in the possession of just a few individuals, of whom the most well-known names are those of the Kochs and also of Ted Turner, a media mogul of times past who, all by himself (and possibly Jane Fonda if they are still married) owns over two million acres, enough to hold the whole state of Delaware and then some. Did these Intruders in the Snow at the Malheur Bird Refuge have any idea that thus what they were really doing was clearing the way for a small number of fat cats to get even fatter? Such an asoect was never mentioned by the perpetrators during their depredations at the refuge, and it is easier to imagine the outlook imagined by LaVoy Finicum and his wife for those 17,000 acres to become at long last their very own, when, in their big white Dodge Ram pickup with, as Zinda was for some reason at pains to tell us, "a great set of tires," they first pulled onto the grounds of the Malheur bird refuge, a notably modest governmental haven 30 miles down a lonely Oregon road from the nearest settlement, a small town called Burns. It wouldn't be long after Robert LaVoy Finicum's destiny took his hand outside the bird refuge that many others in this anti-government movement seized on his experience to attack the Government with even more vitriol, on behalf of all those already deprived young beings on the temporarily forsaken Finicum spread back in Arizona, who would now have to find their way through the rest of their boyhoods minus his guiding hand. Therefore at this vantage point in the tale of the ill-conceived and therefore ill-fated taking of the Malheur bird sanctuary by a band of mostly out-of-state ne'erdo wells, it is impossible to see any connection between that effort in Oregon and the gargantuan task back in Arizona of taking care of half a hundred male juveniles who had all been conceived and carried through to birth and their earliest years by other people, who, however, for whatever reasons were now no longer in the picture. Even in the best of situations, boys at that stage in the development of the human organism are prone to being dissatisfied with their lot in life, and to saying so and acting it out in a huge variety of unpleasant ways. We are assured by Zinda that Finicum was a friendly, pleasant man, as shown by the photo that Finicum gladly allowed his wife to take of himself alongside Zinda, in Utah, during those heady first days of the refuge takeover in Oregon, though Finicum had probably sensed that that writer was not on his side. I suppose that Zinda didn’t tell Finicum what he told us, his readers, namely that before he fell in with Finicum himself, he had tried his best to get the authorities to detain the man, and I am quite sure that Finicum and his wife would strongly agree that they would both be much better off today if this C. Zinda interloper had succeeded. Finicum already was well known for his dedication to anti-government causes, and that plus his likeability must have added greatly to his prestige among those rowdies at Malheur, who called themselves "protestors" and said that they had taken over the refuge in support of two local ranchers named Hammond who, in their defiance of the BLM, had been convicted of arson and were well on their way to serving time. All indications are that they did so gratefully, perhaps having sensed that their family and friends would not see this decidedly hostile takeover of the bird refuge as the best thing that had ever happened in their Harney County. The good people of Harney did not want the refuge "given back" to them, as the badly deluded invaders said was their goal, and the locals generally said as much all through this incident. So, on almost the same day that the invaders arrived, the Hammonds checked into prison to begin serving their sentences, with nary an objection. Finicum quickly became the spokesman for the group at Malheur, which kept growing by the day, till the number of illegal occupiers rose to possibly as many as the 25 who later faced charges, to say nothing of members of the media and onlookers, who arrived in much greater numbers, and he was remarked by the reporters for another picture that someone snapped of him, showing him giving an interview while huddled under a tarp, with a loaded gun close at hand. At this time it was suggested that “LaVoy” means “the Tarp,” though that is more likely to mean something like "I'm going," in Spanish. The instigators and leaders of this takeover were two brothers, Ammon and Ryan Bundy, and they were sons and helpers of an aged reprobate named Cliven Bundy, who, in 2014 near a place called Bunkerville in that other largely desert state, Nevada, had gotten great prestige in such circles by having seemed to face down federal officials made perhaps too wary because of earlier face-offs, especially one that took place near Waco, Texas, in 1993, involving a cult, and that had ended with terrible losses in lives, among the cultists and the lawmen. The more recent confrontation in Nevada, engineered in 2014 by the senior Bundy, did not involve carnage -- the federals backed away, and these land militants saw that as having been a great victory for themselves and a model for future confrontations – except that I think it's safe to say that everything about this 2016 follow-up in Oregon, two years farther on and staged by two of Cliven Bundy's unlucky offspring, guaranteed the eventual failure of this latest clash with the Government from its very start, no matter how well everything seemed to go for these men in the first three or four weeks. Soon enough the invasion of Malheur came to be seen not as another victory for all right-thinking cowboys but instead as an exercise in idiocy, with, in the end, absolutely none of its participants coming off as anything other than nutcases, and that included even the shrewd, affable, articulate, and seemingly level-headed possessor of an attentive wife and the option of always being able to go back to a profitable thing at home, LaVoy Finicum himself. It turned out that the authorities had taken Waco deeply to heart and had learned from the mistakes they had made there and in other places, while these 2016 dummies at the Oregon bird refuge trusted far too much in making stuff up as they went along, so that the choices they made were invariably not in their favor. And that started with their choice of a place for stirring up trouble that in its isolation was literally only for the birds, and mostly migratory ones at that. And in the dead of winter? They hoped to be joined by legions of the angry like-minded, but that didn’t happen. Malheur was much too far from anything and everything, and only Russians would join a revolution in the snow and the ice anyway. Right? When the end came, not much longer than five weeks after its January 2 inception, many people thought that the authorities had taken far too long to act in the name of law and order, but it seemed to me that things suddenly broke open so fast that it made those past several weeks of apparent government inaction appear to have really taken hardly any time at all. In a startling display of unfounded confidence, a little convoy of the gang left the refuge and set out in the cold darkness for a town 100 miles away, not knowing that thereby they were fulfilling a prophecy that one wit had made at the occupation’s start, which was that these bozos would be singing a very different tune when the temperature started hitting 15 below zero. And, while suffering at home here in Virginia when the mornings were regularly reading 15 above, I had had a good time awaiting that happy day of much worse that was sure to arrive in Oregon. Meanwhile maybe Finicum and his friends anticipated warming up a little in that distant town. But not far from the refuge they ran into a surprise roadblock heavily manned by the till then almost invisible Law. The others in the convoy stood down, but the driver of a somewhat familiar big white pickup gunned his engine and raced off, only to encounter another roadblock a short distance away and was abruptly brought up short by a snowbank and stopped permanently after almost hitting one of the shouting law officers, who by then were probably in a big panic themselves, now that a carefully calculated moment that had been long awaited and dreaded lest it go wrong was actually at hand. That is something that must happen all the time, considering how often I have seen law officers on film, real or dramatized, shouting so frantically and loudly after they burst in on the scene that I can’t understand how they expect anyone that they’re accosting to understand them enough to get even a hint of whatever it is that the cops want them to do. The pickup’s driver jumped out and started running toward the officers, while they ordered him to stop. He stopped and held his hands up, but then he made a serious mistake. He reached down to a pocket that the FBI later said contained a loaded gun. And two Oregon state troopers fired, and this man became the first and only fatality of the takeover. Strangely, I thought, the shot man turned out to be non other than the group's most visible and most pertinent member, aside from also being the most expressive -- LaVoy Finicum. All the others in the convoy, including the Bundy brothers, were careful to be subdued enough to be arrested and safely carted off to jail. And in the succeeding days, with their leaders having been suddenly taken off the chessboard, more straggled out of the bird sanctuary and were grabbed, with the last holdout, after belatedly noticing that he was there all alone, throwing it all in on February 11, all last minute threats and numerous other verbal scurrilities notwithstanding. And, at nearly the same moment, as a big and completely unexpected bonus for law enforcement, Cliven Bundy himself was nabbed at the airport in Portland, Oregon, a five-hour drive from Malheur but much farther than that from his home in Nevada, which he, too, had improvidently left and surely now spends every day wishing he hadn't. Trying to show the younguns what had worked for him, which was to have so many confederates on the scene with guns pointed that the Feds would think twice and then wait for another day, he had lavoyed up to Oregon and had attended a Finicum memorial service while grandly sitting on a horse. And, as a result of finally being as deluded as his sons but, to the great joy of many and with the Oregon authorities steadfastly denying him bail, Cliven Bundy will now have to stand trial, not because of his intentions in 2016 on behalf of his progeny but for what he did during his supposed victory over the Government in Nevada, two years previously. In spite of LaVoy Finicum's newly gained fans loudly insisting that he had been prepared to die for the cause and had acted accordingly, I strongly doubt that he would’ve welcomed the symbol that he quickly became, complete with makeshift memorials to him that were almost instantly set up on the lonely road to the bird refuge. Something keeps making me believe that he liked the process of living and trying to pull off these hustles, intensely, and that he jumped out of that truck and ran toward the police only while calling himself letting them see what Chris Zinda had seen in him in Utah, and he reached for his pocket only with the intention of throwing down harmlessly on the snow an object that till then, in all the excitement, he must have forgotten he was carrying and which had been one of his badges of honor among those oafs in the refuge but now ironically became the hidden instrument of his death. If he had intended to go out of there fighting, wouldn't he have jumped out of the truck with gun in hand? The people who answered the call to join in the fun at the invaded bird refuge near Burns, Oregon must not have known that one brings loaded guns to wars but never to protests. That’s the moral of what happened with Robert LaVoy Finicum -- if we can leave out the possibility that it had not been at all wise for him to let himself also be photographed while he was happily rifling through Paiute artifacts at Malheur. Finicum’s wife was not reported as being in any of these incidents. I suppose that, seeing the general tenor of what things were coming to inside the refuge and unsure of what he could do about it, except that he himself couldn't cut and run (after all he had a position to protect), Finicum had long since sent her back to home on the range in the slightly less noisome company of the steers and the juveniles in Arizona, while in Oregon he went on to become something that it’s hard to imagine anyone as apparently clever and sly as he appeared to have been would seek -- an accidental martyr for the sad, sad cause of land theft already reprised from the Paiutes and from, before them, unknown others a time or two. The occupation of the Malheur bird refuge left behind many lessons for future incidents of that kind, One wonders how many of those admonitions will be taken into account in the future, before, eventually, they are all forgotten. Malheur was a textbook case of how, in misconceived episodes like this, the leaders are guilty of filling their followers with goals and methods solidly seated in delusions, while the followers are equally guilty, simply by following and so shoring up the delusions of their leaders. Or, put more tersely, "Leave stupid behind." In fact, because all of it is almost certainly stupid anyway, just forget the whole thing. Malheur also posed the question of what kind of a country can a nation possibly be if it all becomes just the collected fiefdoms of a few individuals who maintain power only by hiring large groups of armed thugs, some of them in uniform and wearing badges and some not. The people working to bring that about ought to know that that’s never going to work in the long run that gets shorter with each day.. It’s so sad that the same garbage -- of people who see themselves as being the chosen few and as such they are entitled to possessing everything in sight -- has to be gone through over and over again, ad infinitum and also ad nauseum. President Obama has instantly come under the completely predictable fire of ever-infuriated Republicans for passing up attending the goodbye and good riddance ceremony for a man who spent 30 years doing all he could under the vestments of the Supreme Court to help nudge the U.S. ever closer to the kind of fascist dungpile in which, by the year 1941, the Germans found themselves hopelessly mired and that has just recently finished engulfing Israel. But who in his right mind would even think, in what has been an unusually frigid February in the Mid-Atlantic -- of subjecting his mind to the torture of going to the funeral of a scoundrel like A. Scalia, when in just a few more weeks Obama is scheduled to become the first U.S. President in the living memory of the majority of Americans to set foot on the territory of its neighbor, Cuba, and in the more bracing month of March to enjoy the warm, bright waters and sands of that unforgivably wronged Caribbean nation? Well, I guess there are quite a few Republicans who would put attending just such a dark, sepulchral observance ahead of anything else, except impeaching the President. But then it has also been decades now since any Republicans could be seen as having anything near anyone else's ideas of rational and redemptive ways of thinking. In “The Guardian” for 17 Feb of this year, 2016, there is a wonderful and singularly hilarious article written by Amber Jamieson that tells of how a website that disperses such info announced that an anti-Beyoncẻ protest would be held in front of the National Football League offices in NYC. This was taken seriously enough that the police cordoned off part of Park Avenue in anticipation of a crowd, since Beyoncẻ, already incredibly famous in her own right and for a long time, got a lot of added publicity, pro and con, for her performance during a break in this year’s telecast of that inconsequential football game called "the Super Bowl" or some such, in which she and her backup singers swooped, swirled, and swayed while celebrating "black" pride and the Black Panthers of many a long year ago. That second “IN” was parenthesized because the song Beyoncẻ sang was called “Formation.” I have to admit that for someone as old as me and who has been pretty much outside the loop of youth popularity for just as long, "Formation" wasn’t the easiest song or concept to decipher, and the best that I could make out of the lyrics was that the singer wouldn't mind having fun with a Black Panther of today. I was interested in this protest because perhaps I was unconsciously recalling what happened with another bigtime singer named Janet Jackson and also after hearing about a "Saturday Night Live" show that appeared a few days after Beyoncẻ's performance and that puzzled and at the same time infuriated some "white" folks when they realized that with that halftime performance and with that SNL show, it was being revealed "for the first time" that though Beyoncẻ is quite light-skinned with other features to match, she is not trueblue "white." Instead she is carrying some of that awful thing inappropriately but widely called "black" ancestry, and therefore she is for all intents and purposes that undesirable thing called "black." It was turning out that a number of so-called “white” folk, maybe even most, had never known that, and a certain number of them therefore felt that they had been tricked and, yea, betrayed in some way. The fact that they ought to have already had some idea baffled me, though not totally. Not being into her kind of music, I had never paid the slightest attention to Beyoncẻ, aside from noting what I think is her somewhat awkward name, and I would never know who she -- or Rihanna – are, even if one or the other were to come bouncing into the room and plopped themselves on my lap. I would definitely recognize Mariah Carey, though, and Janet Jackson, too. Have I left out anyone else who is in their league? Janet Jackson likewise got into big trouble for a performance at another Super Bowl not long ago, totally unfairly and for race reasons, when a "white" guy named Justin Timberlake performing with her intentionally or unintentionally jerked off part of the apparel covering her chest, and ever afterward Ms Jackson, not Timberlake, was roundly condemned because he, not she, bared one of her breasts on public TV for all to see, and at a football game, a religious event. Even while most likely I had never studied a pic of Beyoncẻ, I had never had the slightest doubt that, using the unscientific and disavowed "one drop" standard that nevertheless persists to this day and that suggests nothing so much as that African blood is far more potent and vital than are European corpuscles and is a standard still used only as a form of mental shorthand, Beyoncẻ is indeed a member of that gloriously prismatically-hued group that is so wrongly and viciously called "black" and for which I like to substitute the much more appropriate term "Rainbow." (Never mind the gay people.) And I'm certain that all the others in my census category thought so, too. I can’t exactly say how that could’ve been the case. The old saying, “It takes one to know one,” springs to mind, but that is usually said only about circumstances less happy than looking into Beyoncẻ’s appearance and its various subtleties. Those subtleties are so great that they are probably generic, and that might account for why her likeness has never stuck in my mind. After having only now looked through a large number of Beyonce’s photos all on one Internet page, I see the problem. Beyoncẻ is not in possession of her own face! Not, that is, in the sense that, say, Whoopi Goldberg is always easily recognizable in all situations. Instead Beyoncẻ looks identical to many millions of other women of a certain age range all over the globe, regardless of color, creed, affluence, or attitude. That shortage of distinctiveness must be a big contributor to her widespread popularity, though I’m also wondering how even her best friends can recognize her from one day to the next. The Beyoncẻ supporters waited and waited for her detractors to show up at the NFL doorsteps so that they could have a debate, and finally a guy wandered into the area reserved for that group. But he insisted that he was not an anti-Beyoncẻ activist and he just happened to wander by, though, now that he was being asked by eager reporters, he admitted to having reservations to her having made what amounted to a political statement at what after all was a football game, for God’s sake! A second and a little later a third person showed up in the anti area, both of them there on purpose but failing to carry their outlooks any farther than had the first "accidental" guy. But that amounted to ALL of the anti-Beyoncẻ protestors, a sum total of three in all of enormous New York City and beyond, with the second of those being shocked, having expected thousands of his kind to be there, though it was determined later that the demonstration had apparently been called into being by only one person instead of by a recognized protest group. Never mind. Because there were so few of them, all three of those Beyoncẻ critics got to have their extended statements printed in the media. The much more numerous members of the pro-Beyoncẻ group didn't enjoy such consideration. But in her article Ms Jamieson enabled those pro people to get off the last and the best shot regardless, aside from that sign that I quoted. In reply to the rationales for attacking Beyoncẻ that the anti people had given, one of her supporters said that this protest had worked out in a way that showed that "It's easier to be racist online than it is in real life." I believe that Beyoncẻ and all those who all along had known who and what she is would have amened, "Ain't that the truth!" And if that performance at the ball game was a heartfelt statement made by her and not just a passing fancy of a theme for the halftime, I hope that this Guardian article and that "protest" really made her year. So far, police in Tampa and Miami, two places in Florida, have been slow to sign up to make some extra bread by providing security at big concerts a couple of months hence, headlined by Beyoncẻ. They claim that at the football game, she displayed an attitude toward police. Unless their ear drums have already been punctured, because of spending too much time among other cops, I would think they would be more concerned about the integrity of their ears, concerts for the young being what they have been for years, when it comes to the decibels. I wonder how those officers will be punished for the felony of forgoing Beyoncẻ? Most likely it will take the form of suddenly discovering that they have ceased to be for real. There are numerous times in movies when I wish the makers could've moved themselves to have characters say aloud what they're thinking. The main character in the 1990 British film "House of Cards," played by Ian Richardson, did so in profusion, and it added greatly to the film's effect. But that was a big exception. Otherwise, what used to be called "dramatic asides" are heard so rarely nowadays that it must mean that there's a hard and fast rule of movie-making to avoid them at all costs. It must have been decided long ago that the inarticulate hero or heroine is superbly chic or cool or awesome, while the moviegoer cannot be expected to tolerate anything even remotely approaching self-revelation. A reflection of modern life? Oh well. I guess that does save the writing and the speaking of hundreds of extra lines, even it it does mean populating the average movie with animated lumps who seem to be indulging in endless sleepwalking and little else. If the movie viewers need to hear reasons, reactions, and the like articulated, let them supply their own scripts. --Sorry. This rant must've been launched after having just finished struggling through a 2010 Russian film that exhibited this glaring defect in painful profusion. Titled "How I Ended My Summer," it could much more aptly have borne the title, "How I Spent the Whole Summer Looking Stupid and Acting Accordingly." It tells of two men maintaining a cold, bleak existence at a weather station somewhere on an island in the Arctic wastes. One day, while the older and more serious of the pair is out fishing, the younger man happens to be indoors when an urgent radio message comes in, saying that his co-worker's beloved wife and child have just been killed in an auto accident. The younger worker is told to pass this notification along to his co-worker, along with assurance that a ship is being sent to bring the man back to the mainland in his bereavement. Because this is a movie made by someone who is obviously anxious not to be seen as being behind the times, when the older worker returns from his fishing trip, the younger man tells him absolutely nothing and instead keeps that message strictly to himself, for reasons that naturally we are left to figure out for ourselves -- necessarily unsatisfactorily, because that young guy's vocabulary doesn't extend past occasionally uttered four-letter expletives. Of course it all eventually comes out anyway, but with consequences far, far worse that they would have been if the news had been conveyed as was requested. But this is how by far most of your bad and even worse movie plots go. Things are carefully kept concealed till it's too late, when real life keeps telling us that everything and even the very worse news is always best revealed RIGHT NOW, and in language a little past the grunts of a bored polar bear. A second 2010 film, "Barney's Version", starred Paul Giamatti as another such inarticulate hero, though I suppose that that bothered absolutely no one else, especially because Giamatti has such a big cult following that everything he does is greatly admired, though I couldn't see anything in the character that he played that would have added to his lustre. That title character, Barney, was a nasty, spiteful, and thoughtless slob through and through, and it was inexplicable to me that nevertheless a succession of three dazzling women saw enough in him that they consented to share his life in marriage. Why even make a movie about a guy like this, except to exhibit that trio of actresses? Giamatti's face is curious, but I can't see how it could ever have made a woman's heart throb. I guess we are supposed to think that Barney was somehow above the first two wives because they were unfaithful to him, while overlooking the fact that he was no model of devotion to either woman, while after pursuing the third woman relentlessly till she said, "Yes," he nevertheless didn't make things too peachy keen for her either as time went on, as she testifies when she isn't unaccountably saying how great their years together were. He indulged in a lot of uglinesses that made no sense and that he didn't try to excuse, though there were plenty of occasions when he badly needed to explain himself -- to his wives, to the viewers, and also to himself. But here, as in the aforementioned Russian film, the moviemakers saved a lot of work on the part of the writers having to write more lines, to say nothing of being much more careful with motivations, while the director and the actors had far fewer lines to have to deal with, and the main character just kept slopping right along while saying nothing to justify himself or to enlighten others. One scene that illustrates this especially stuck in my mind. In the beginning of the period when his marriage to that third wife that he continues to love so much is starting to go wrong, Barney is in the kitchen doing that favorite kitchen business of all film directors -- using a razor-sharp knife to chop something with lightning fast strokes while, if anyone else is around, talking all the while, at serious peril therefore I would think to the actor's fingers. That beloved third wife tells him that he should freeze the onion first because then cutting it wouldn't bring the well-known onion tears. Barney doesn't react. Later, when the marriage is on the rocks, he comes home to find the house empty, and while he is looking in his refrigerator he sees a lone onion sitting in the freezer compartment. He studies the onion for some time before closing the freezer door, still without saying a word. What did Barney think that lone, frozen onion meant? He must've had some idea. The writers, the director must've had speculations of some kind. That complete silence strikes me as being very strange. Did Giamatti's character have no inner voice that was constantly speaking to him, loud and clear? I have always had such a thing, and it talks to me every minute of the day. I thought it was like that with everybody, and I have trouble believing that it's not. I assume that it's taught at film schools that to leave things unsaid is the most effective way to go. I don't agree. I think it would be a better world if people in all situations would explain themselves, clearly and truthfully, even in something as make-believe as a movie, and the fact that so many movie plots turn on things going wrong because so much was left unsaid that could easily have been said aloud backs up that contention. I guess that's why fate never placed me even remotely in a position to be a screenwriter. And even if I had been lucky enough to realize that dream, still all the lines I would have written to convey a character's inner thoughts, even if if only occasionally, would still have been lopped off relentlessly by the arbitrary committees that I am told make most movies. In movies, as in real life, people just do things. There is never any need to say why they did such and such, even if they knew why -- or were articulate enough to express themselves. Of course people have all sorts of excuses to be that way in real life. Not so much in movies. After all, movies are just another form of communication, which, above all, means passing along information. I don't think that even in the Silent Era that I just missed experiencing, movies were meant to be as stingy in that respect as abstract paintings. -- I'm aware of what could be a huge hole in what I just said, supplied by my very own earliest experience. I was born in 1931, before TV. which didn't become common (in more than one way) till the 1950's. Instead I was raised on radio stories, which I tended to listen to all day long and well into the nights, when I wasn't outside the house on explorations of various kinds. This explains why I have such a vivid imagination, and, among many other things, why the sight of a naked woman has never made me salivate or catch my breath. This is because with any women I see, I can instantly and accurately unclothe them mentally. That is, to my satisfaction. I don't need to touch every damn thing. I have long known that that is one of life's biggest dangers. And don't ask me what I have to endure even today, in my very old age, in my numerous highly detailed and colorful dreams. That comes from years of having had to set up in my coalescing child's mind all day long elaborate images of Lorenzo Jones, Stella Dallas, The Shadow, Jack Benny and his people, and many. many others who otherwise were only voices coming through a grille cloth. Therefore how can I possibly justify any criticism of having to furnish my own renditions of the brain processes of today's male and female film heroes? I can only say that I must be of the opinion that I SHOULDN'T HAVE TO! Just as today I don't have to use typewriters anymore when I have computer word processors, or I can catch a plane to California instead of riding 100 stagecoaches. Otherwise, what use is the passage of Time? Where is "Progress?" To be or Not to be Racist? A while ago a “white” woman whose blog I used to follow before she stopped writing it became deeply troubled after she found herself fighting the ridiculous concern that she could be a racist. This happened because in her very understandable zeal to defend her gender against all attacks, she posted on Facebook something that she might better have left unrevealed. That item consisted of an extremely ugly diatribe against women supposedly uttered by a Rainbow guy who supposedly was a pastor. By way of explanation here, though the "white" persons I have met who would accept this concept have been few and far between, I guess because so many of them have been so thoroughly conditioned to see so-called "black" people as being invariably unattractive to the eye, I have long regarded “Rainbows” as being by far the best term to use for so-called “black” Americans. We -- they -- bear all the skin hues of the human spectrum, while I am still waiting for someone to say what it is about gay people that in any way suggests the rainbow -- that many-hued weather wonder that North Africans so poetically call “the bride of the rain” and that gays have wrongheadedly and cruelly misappropriated as their own. It can't be their super-exclusive sexual preferences -- the only thing that distinguishes them from everyone else. I think that broadside by a surely phony pastor was just a right wing dirty trick designed to stir up animosity by Euro (i.e. European-derived or “white") women toward Rainbows -- two groups that are especially unlikely to give the Republicans a majority of their votes. This lady's post prominently displayed a picture of the "Reverend," as if to make sure that there could be no mistake about certain things. Nevertheless ... minutes after this lady hit her "post" button she had dozens of responses. (Obviously she is in a world over there at Facebook that I know nothing about on Blogger and on DKos, and I couldn’t deal with it if I did know.) This quickly led to a many-pronged brouhaha that left her in a web of confusion and unwarranted doubt about her own leanings, which till then she had thought were quite the opposite of those of the U.S.'s highly bigoted right wing, when she had meant only to expose the Reverend's deadly diatribe to the withering rays of the Sun. From having, by an odd trick of fate and accidents of geography, lived the first half of my life almost entirely among so-called "black" people and now the second half of it mainly among so-called "white" people, I am certain that the grasp that Euros generally have of racism falls short of the understanding that a Rainbow would have. I'm not talking here about often oblivious and unconscious younger Rainbows. I'm talking more about older Rainbows, and especially the really old ones, like me, who grew up under the heels of the Jim Crow system when it had the national blessing of this country's legal system. The problem that "white" people have is precisely the fact that they are in such a majority -- a situation that won't end any time soon, though they would deny that as ferociously as they would deny that their understanding of racism or of any other concept is in any way less than that of “black” people. Euros don't take into account the fact that the laws of mathematics and probability alone guarantee that in their day-to-day life they mostly see only each other, and historically they have not been defined by having racism exerted against them, which is exactly the opposite of the Rainbow experience. Most Rainbows may live in mostly Rainbow communities, but they still see a lot more of "white" people in various capacities than in the reverse, and they hear and feel even more, by a long shot. So what happens is that every once in a great while, as with this lady, Euros -- several of them anyway -- might wonder if they are racists when actually they're not, while -- more often -- others actually are being racist when, again erroneously, they think and they want all others to think that the opposite is really the case. One of this lady’s commenters accidentally cast a very illuminating light on this when he said that he has come to believe that there are "more black racists than there are white ones." Yet even though he may have meant proportionately, still how could that be, when one also reminds himself of the fact that racism is primarily a matter of strength and force? Racism is always exerted primarily by the group that controls all the instruments of power in a society -- the laws, the media, the educational institutions, the jobs, the opportunities, and all the rest of that --and they feel that this puts them in a position to exert any kind of bias they please against those for whom they have only contempt, because of differences in melanin count or hair direction, or because of a differing language, different countries of recent origin, things their predecessors have historically done to those opposite groups, and a variety of other reasons, and you will never see this situation existing in the reverse. Euros have a large number of vicious epithets that they use to denote Rainbows, while Rainbows, though they have never been found to be lacking in language skills in any arena in which they are pitted against Euros, have yet to come up with even one term that comes anywhere close to matching those epithets in virulence to use against Euros. This, all by itself, is decisive evidence of where the deepest and widest reservoirs of American race hatred are to be found. What you will see in Rainbows iis instead the condition of being race-conscious or race-minded. That is quite different from being racist, and instead it's a totally benign thing, even though some Euros, thinking themselves to be the very picture of cleverness and perceptiveness, will fall all over themselves trying to portray that consciousness as being "racist". Again, because there are so many of them, Euros don't know what it is to be defined by race, while for badly outnumbered and outgunned Rainbows, that situation has existed from the very beginning of the American Experience, and so, when faced with difficulties, quite often Rainbows try to work things out by starting from their awareness, their consciousness, of what sets them apart from the Euros. The validity of doing that may vary somewhat from one era to the next, but it has been so reliable in the past that Rainbows of any sharpness and acuity see no reason to abandon race-consciousness just yet, especially when there are political forces working just as hard as they can to make respectable and legal all over again all those evil customs and practices of this country's dark past, as if all the intervening years of striving for better attitudes and behavior by the more enlightened of this country's majority citizens have meant exactly nothing.